Paperback, 9.25 x 12.5 in. / 128 pgs / 68 color / 20 bw. Edited by Max Hollein, Esther Schlicht. For the last 50 years, Erró has been creating paintings that make equal use of art history, cartoons, comic books, politics, popular culture and social tableaux. 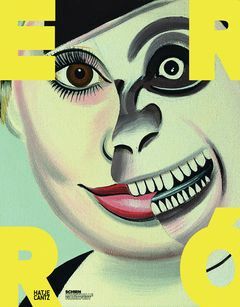 This publication features Erró’s series Scapes, and for the first time, presents the entire 1968 Monster cycle--double portraits that contrast the official likenesses of celebrities with monstrously distorted visages. FORMAT: Pbk, 9.25 x 12.5 in. / 128 pgs / 68 color / 20 b&w.